Vandruff’s Island lies just outside Rock Island’s border, with this view from Black Hawk’s Watch Tower being enjoyed by thousands through the decades. This postcard, from the Augustana College Library Special Collections, dates from around 1920 and shows the island with the Rock River on either side and the town of Milan visible in the distance. In these early years, the island was completely rural, with Vandruff supplementing his farm income by operating a ferry. He also sold liquor to the Indians, angering Black Hawk, who told both Vandruff and Wells to leave the area. One event that helped settlers justify the ousting of the Indian natives was a successful raid led by Black Hawk to destroy some 35 gallons of Vandruff’s whiskey, whiskey that Black Hawk believed was destroying his people. George Wickstrom, quoting an 1854 Illinois history by Illinois’ seventh governor, Thomas Ford, calls the island the site of one of the strangest battles of the Black Hawk war. It was attacked on June 25, 1831, by 2000 white men, including a small local militia who crossed the south branch of the river in a steamboat, intending to subdue anyone on the island, and then invade the Indian village across the north branch of the river. However the island was so covered with bushes and vines that it could not be penetrated and the militia had to be rescued by boat. Vandruff’s Island was the site of another major boondoggle in 1836, when a canal, intended to bypass the Rock River rapids, was begun near the western tip of the Island using $200, 000 that the Illinois legislature had offered to each county for canals or railroads. The canal was never completed, but the money was presumably spent. In 1867, after being forced to leave Arsenal Island because the US Government took it over, David B. Sears purchased much of the forested Vandruff’s Island and he immediately built a power dam. Once power was available, he and others built mills and factories on the island. Although Vandruff’s Island was considered part of Camden or Camden Mills, the town on the south side of the Rock River, Sears platted another town he named for himself across the north branch of the river. One industrial building on the island lasted well into the memory of many readers. The three-story building erected in 1871 was commonly called the old watch factory for its initial use, though it also served as a piano-player factory. Since European watches were considered to be of premium quality, the watches made here were given an instant cachet by renaming their source – Camden changed its name to Milan, a thoroughly European name. Luckily that lovely historic view is preserved on this postcard. But by the early 1900s, the seeds of future change were sown: There was a small stone quarry on the island. Quarrying ultimately became the main industry. More recently, long after the water powered mills and the agricultural lands have disappeared, so too has a large part of the island itself. 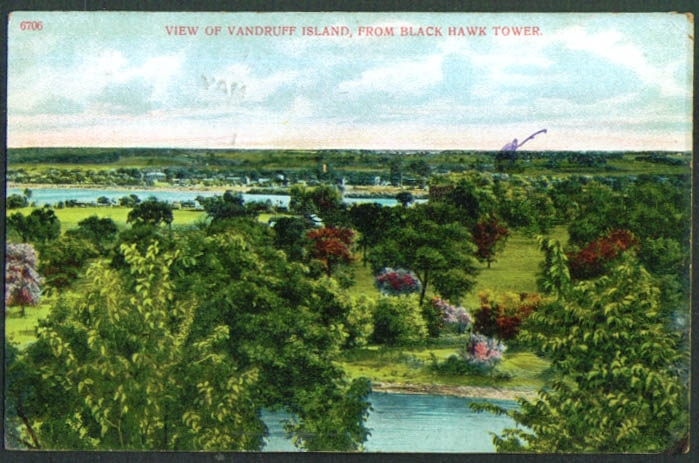 Today the visitor to the Watch Tower Inn at Black Hawk Historic Site is immediately aware of Vandruff’s Island before seeing it. The grinding and howling sounds of conveyors and crushers and the sometimes daily dynamite blasts that resonate through the inn building precede the view from the inn’s plaza. In some distant future, Vandruff’s Island will once again present a pastoral scene from the Watch Tower, but this time there will be a large lake, over a hundred feet deep, rather than the green and wooded landscape on the postcard. We can hope that the quiet lake will be, once again, a source of inspiration and loveliness. This article by Diane Oestreich is slightly modified from the original, which appeared in the Rock Island Argus and Moline Dispatch on October 3, 2004.